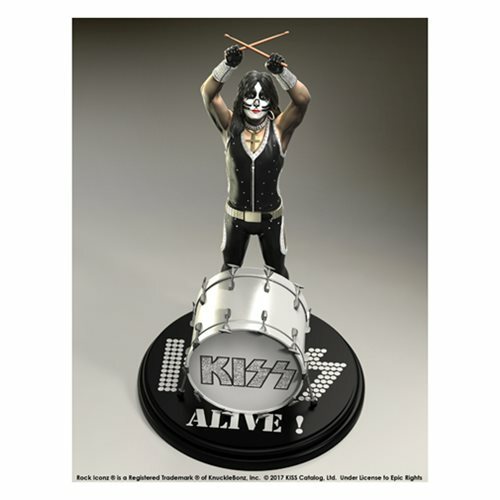 Rock and roll all night and party everyday with this KISS Alive Peter Criss Rock Iconz Statue! This KISS Alive Peter Criss Rock Iconz Statue is created using a team of highly skilled artists to sculpt a remarkable likeness of Peter Criss. This limited edition statue of 3,000 pieces is cast in a polyresin and hand-painted in fine detail. The KISS Alive Peter Criss Rock Iconz statue is hand numbered and a certificate of authenticity is printed on the base of the statue.